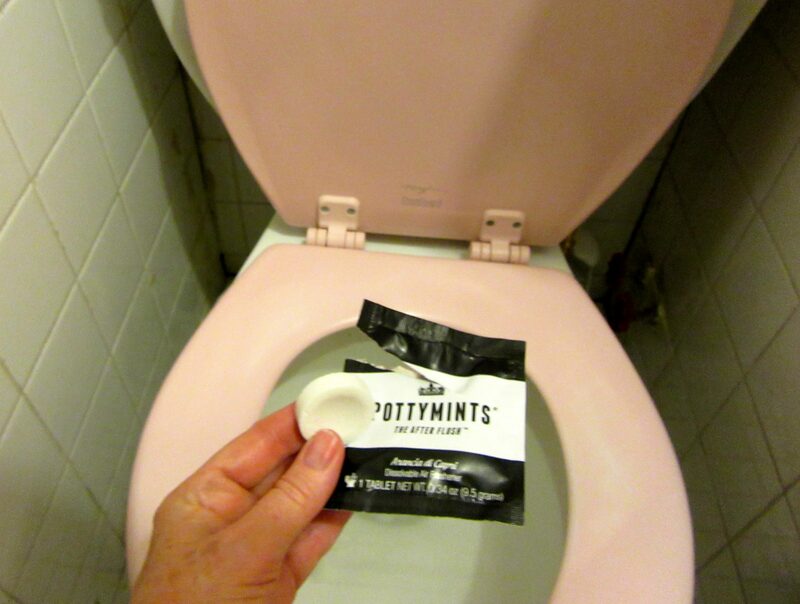 Product Review: POTTYMINTS Disolvable Air Freshener! There is no delicate way to put this: when you share a home with other people, maintaining the quality of the bathroom “atmosphere” is an ongoing consideration. It’s easy enough to light a match or spray some room fresher into the air, but when a solution that’s both discrete and longer-lasting is desired, I’ve got just the thing for the occasional malodorous situation: POTTYMINTS. extra tall toilet with an extravagant bouquet of flowers extending from its bowl to the ceiling. Very impressive! I stopped to talk to POTTYMINTS representative, Matthew Grobman, whose sister and business partner Suzanna Grobman, invented the product after taking a vacation (my guess is they went to Mexico) with her then-boyfriend-now-husband. You can read an abridged version of what I assure you is an hilarious story here. Matthew gave me a few sample packets of POTTYMINTSto try at home and here is what happened next. Behold, the POTTYMINTS displayed on the seat of my toilet! 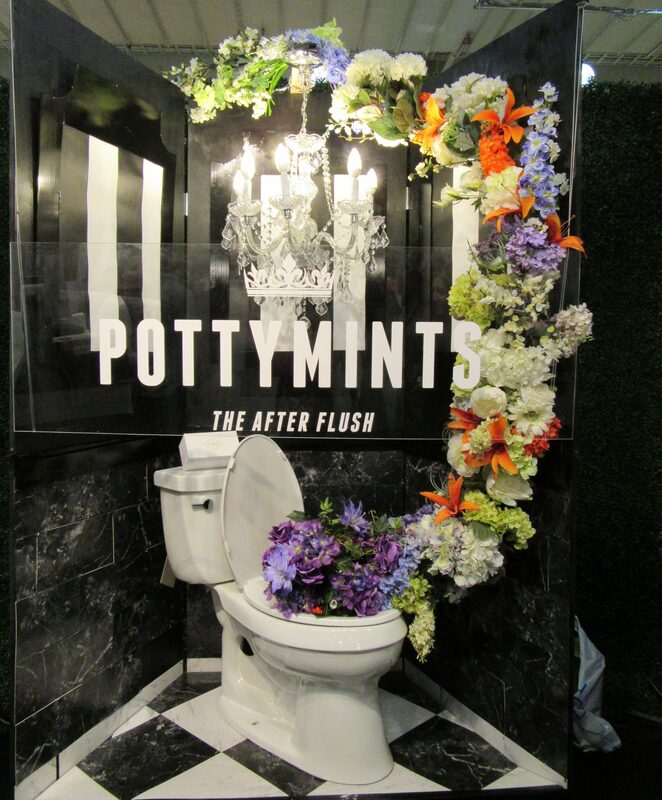 Please note that correct use of the POTTYMINT involves waiting until after the flush (#theafterflush)! After flushing, drop one POTTYMINT into the clean water and watch it go! 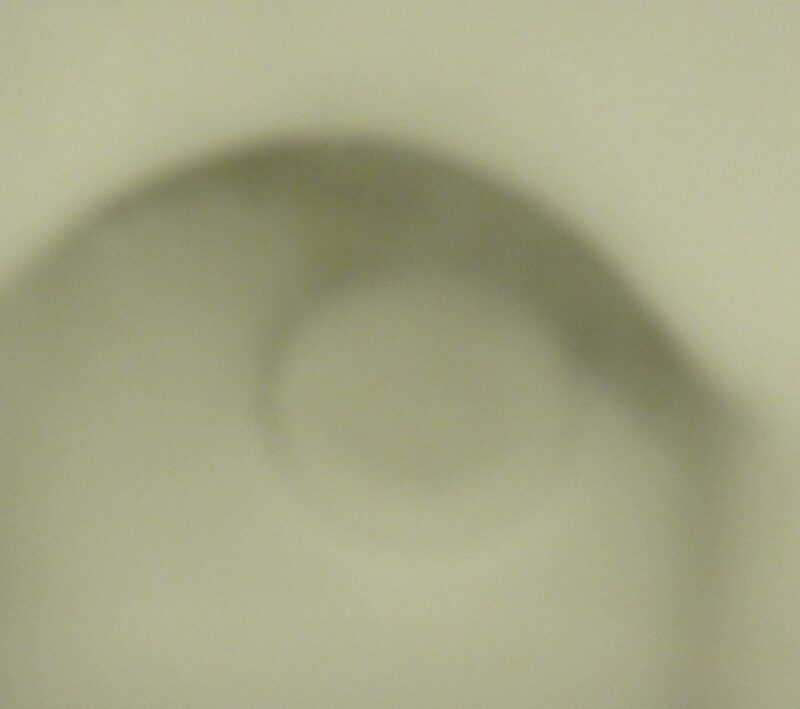 The POTTYMINT will effervesce and dissolve, leaving the air sweet smelling for, not even kidding, a few days! 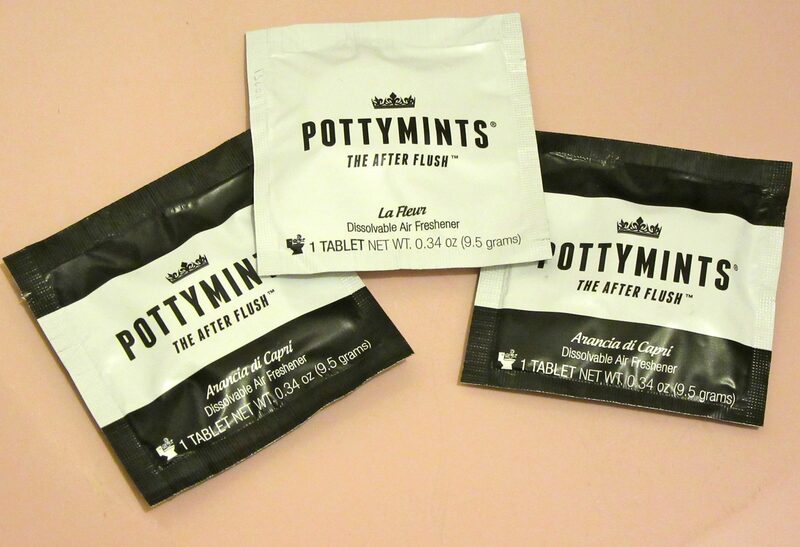 POTTYMINTS are sold in assorted sizes, including a small packet perfect for traveling or just keeping in your purse or bag. All packaging embraces a minimal-yet-elegant design aesthetic — like something you would find in the bathroom at a very fancy hotel and want to take home with you! POTTYMINTS come in two very appealing fragrances: Arancia di Capri (Citrus) and La Fleur (Light Floral). These varieties are effective and impart a fresh and enduring scent without becoming cloying, as some sprays or atomizers can be. 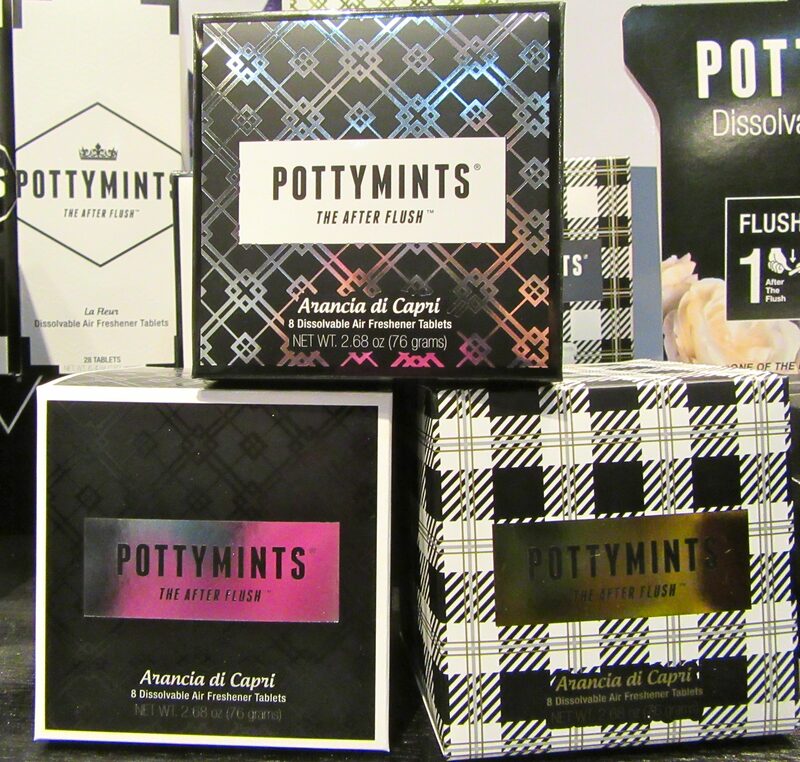 Find out more about POTTYMINTS, and get a 10% discount on your first purchase, at This Link!